Shipment of diamond wire and diamond core bit segment, concrete saw blade has been sent to Mr. Ir** from Russia on JAN 29th, 2019. "Congratulations Mikayla. After the evaluation of all the saw blade supplier, we are very happy with your quality. You will become our important supplier. Now, we ask you to specify the lead time of production for orders of 400 blades, send me the total price, invoice please." "Mikayla and company, you have always been true and honourable to your word. It has been a pleasure dealing with you in this past year. I look forward to many more years to come." 1. Concrete around the world usually differ in hardness, a good conrete core drill bit maybe not working well in another region. 2. Different component and percentage inside concrete affects the drilling effect, for example, steel iron bars and pebble stone requires different kinds of diamond drill bits. 3. Some regions demand fast drilling diamond core bits while some demand long life one, for example, European and American market demands sharp and fast one. 1. Thinner tube body make fast cutting speed, less chipping , smooth and high quality finish. 2. 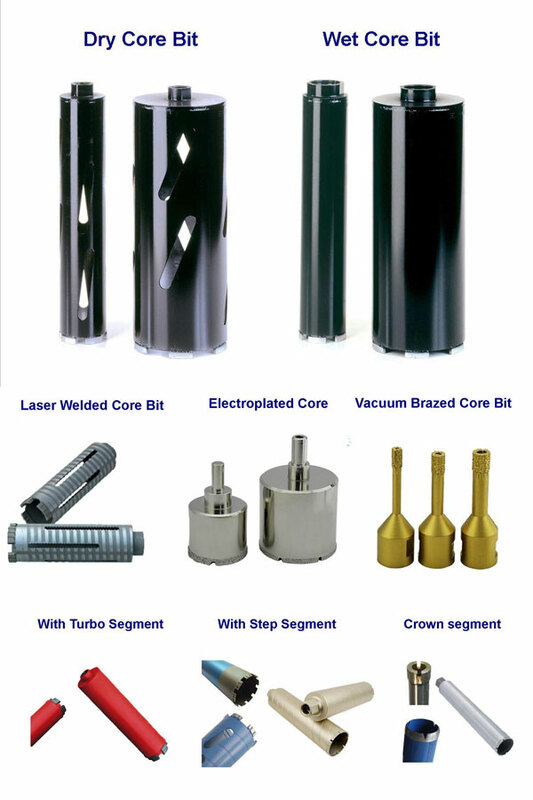 Diamond segments for the core drill bit can be manufactured in different shapes, like roof shape, Arix, turbo, etc. 3. ChinShine has been studying the feedback of thousands tests by incipient customers, and has developed different formula for different customer demand. Diamond Core Drill Bits are used to drill marble, granite, stone, glass, ceramics, porcelain, ceramic and porcelain tile, limestone, slate,and fiberglass. Copyright © 1997-2015, ChinShine Web Design. All Rights Reserved. ChinShine is highly responsiable for its diamond saw blade and diamond segment.